Save The Urban Morris Dancer? Lindsey Save The Urban Morris Dancer? For a while it was being mooted as a key component of the 2012 Olympics opening ceremony and it's claimed a place in the Cultural Olympiad (but then, what hasn't?) But 2009 is the 75th anniversary of the Morris Ring, the national association of men's morris and sword dance clubs, and they're determined to take the opportunity to shake their sticks and jangle their bells to prevent this folk dance tradition from dying out in the 21st century. It's just too embarrassing, see. Whilst many of us are chomping at the bit to get in heels and spangles to ballroom dance or shake our wobbly, fringed bits to a samba vibe, most of us have little inclination to take to the street with a bunch of bearded men in white pyjamas, skip in circles, wave hankies and shout OI. Morris dancing was already ancient hundreds of years ago and is intimately connected to the earth, the countryside and fertility rituals. For sure, it's more at home in the Cotswolds or East Anglia than in the West End but surprisingly, London has its fair share of fervent folky types, home as it is to Cecil Sharp's English Folk Dance and Song Society. The Westminster Morris Men, London Pride and The World Famous Hammersmith Morris Men are all active and ale-drinking in London and we'd be very surprised if Morris men didn't crop up at one of the friendly folklorist events run by SELFS some time soon. So there is hope. The Morris Ring's campaign may well be hampered by its continuing refusal to allow women full membership but luckily there's the more progressive Morris Federation and Open Morris to fly the flag for Morris dancing for all. And, much as it might damage one's street cred to admit it, it's bloody good fun once you get going. Shave the Donkey, anyone? 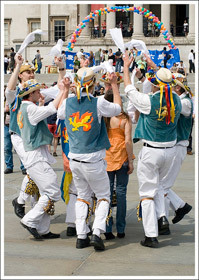 Morris dancers in Trafalgar Square by Simon-K via the Londonist Flickr pool.